Contact centre advisors are often in situations where they just don’t feel that the customer is on the same wavelength as them. Perhaps the advisor has done their best to build rapport with the customer, but their efforts just don’t seem to be appreciated. The key here is filtering, which highly skilled advisors can use to build rapport, as highlighted below. What Is Filtering (in Regard to the Contact Centre)? The following question is often one that divides people: Are you a glass half full or half empty person? But why do people answer this question in different ways? We all take in millions of bits of information every second through our senses, far more than our brains can manage. Thankfully, our brain doesn’t have to cope with this amount of information. Instead the subconscious part of our brain will filter it, leading to much of the information being deleted and only some being retained. Why is this important to understand when communicating with customers? Well, the simple answer is that how an advisor’s brain filters information will not be the same as a customer’s filtering process. The customer and advisor are different people, with very different experiences, memories, beliefs, values, etc. These are some of the factors that play a big part in what we decide to let in and what information we keep out. So, the most important question is: Do you want your customers to retain the information that advisors are providing them rather than deciding it’s not important and deleting it? Of course, the correct answer is yes, but to do this, we must first examine the ways in which the human brain filters. The three most relevant to the contact centre are highlighted below. Think about this for a moment. When you think about a goal that you wish to achieve, do you imagine what it will feel like to achieve this goal? Or do you think about what you want to get away from or stop doing? If you are someone who focuses on working towards a future goal – then you are Towards Thinking. If you tend to focus on what you want to get away from, such as you want to get away from a ‘boring’ job, or ‘avoid eating unhealthily’, then you are Away From Thinking. Customers that pose their queries to the contact centre will be thinking in one of these two ways. Make sure the team is aware of this, and ask each advisor to listen very carefully to the customer’s choice of language, to understand which of the two filters they are using. Is the customer telling you they want to work towards or find a solution? – If so, they are demonstrating “Towards Thinking”. Is the customer telling you about the problem and its impact and how they want to avoid more disappointment or to ensure this situation doesn’t happen again? If so, they are demonstrating “Away from Thinking”. Once the advisor knows which filter the customer is using, they can change their language choices to match it and build rapport with the customer, as demonstrated below. Advisors should be encouraged to focus their communication around how they can help the customer to move away from this situation or avoid it happening again. 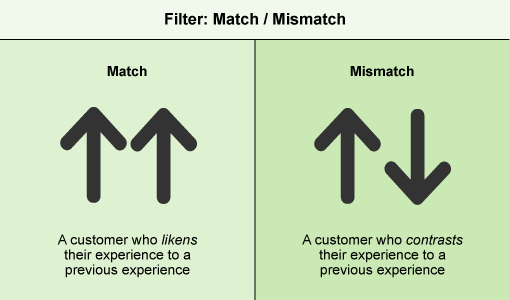 A customer who sorts for a match will look for similarities between an experience that they have previously had and one they’ve just had. 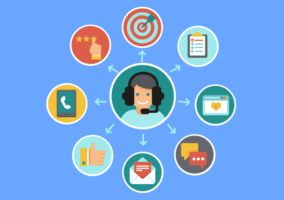 In customer service, a customer will often liken a current service/product to a previous one. A person who sorts for a “mismatch” will contrast their current experience with an experience that they have had previously to highlight the exceptionality of the problem. When an advisor recognises whether the customer is match or mismatch, they can change their approach to help build rapport, as highlighted below. When discussing a particular product/service, the team should be encouraged to talk about the similarities that the product/service has to what the customer has had in the past. Reassuring the customer that the important features that they liked about the last product or service will still be available to them is the key here. Encouraging advisors to ask the customer about what they liked about previous products/services may enable them to find the best possible solution for the customer. When discussing a particular product/service, the team should highlight the differences between products, noting any features which are more suitable to the customer’s needs – if known. To do this, advisors may find it helpful to use a statement similar to the three that are shown below. 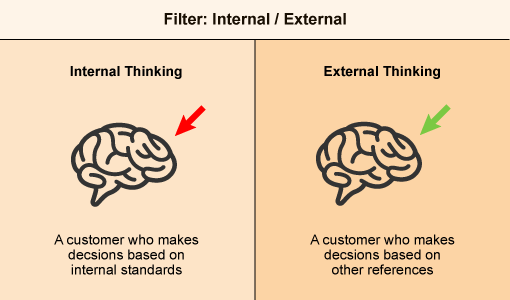 This filtering type covers the process that customers go through when making decisions. An “internal” person gathers information and makes a decision based on their own internal standards. They resist someone who is trying to tell them what to do – particularly if it is based on what other customers think. If a customer makes a comment similar to: “Tell me what options I have, so that I can decide what will work for me,” it is a clear hint that they are an internal person. Whereas an “external” person needs references. They like to hear other people’s opinions to help them make a decision. They also find it useful to know what other customers have found useful. When presenting options to the customer, the advisor would ideally know whether or not the customer is “internal” or “external”, in the interest of rapport building. If so, it might be useful to go by the following advice. Provide the customer with useful information, such as facts and figures, and ask them for their thoughts and ideas. The advisor would ideally help the customer to find the best solution by providing their thoughts and also what they know has worked for other customers. 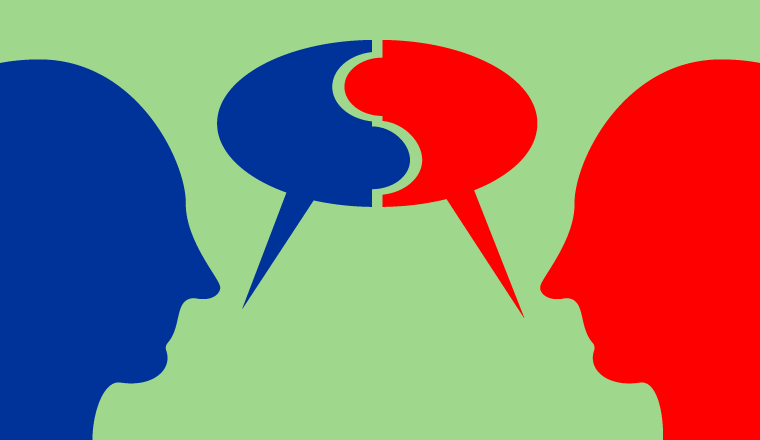 If two people use the same filters in conversation, this will often lead to a more productive conversation as well as build rapport. Equally, if they are using very different filters, then this can often lead to frustration. 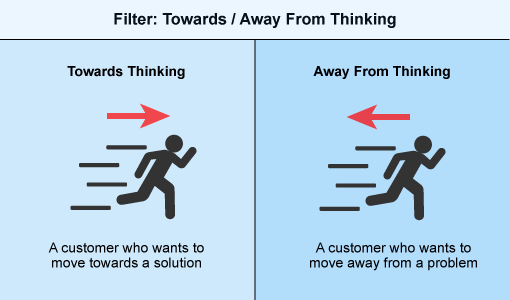 By understanding each of the three filters above, advisors will be better able to “speak in the same language” as the customer and thereby develop flexibility in the way that they choose to respond. Maybe it will even help internal communication between colleagues and boost the atmosphere in the contact centre. Have you ever tried to train advisors in using these filters? What have your experiences been like? Please share your thoughts and experiences in an email to Call Centre Helper.